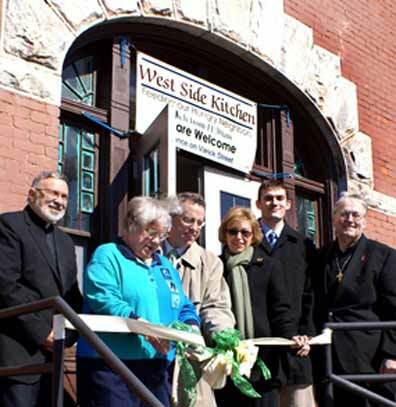 UTICA, Aug. 20, 2009 -- Mother Marianne's West Side Kitchen hit a new milestone this month, serving 30,000 meals since opening its doors March 10, 2008, announced Deacon Gil Nadeau, director. "We served 10,000 meals in just the past five months," the deacon noted. The soup kitchen serves lunch Monday through Saturday and is named after parish daughter Bl. Mother Marianne Cope, missionary to the lepers of Hawaii's Molokai. "We serve primarily the working poor, the jobless and the homeless," Deacon Nadeau said. "You can't put a price tag on that. We're totally volunteer, and operate on on-going donations of food and dollars. That's why it works, why we're self-sufficient." He added: "Anyone interested in volunteering or helping out may check out our website, WestSideKithen.org."